Dallas emergency sirens may sound over the next few weeks, even when it is not the routine first Wednesday of the month noon test, but it is not necessarily cause for alarm. 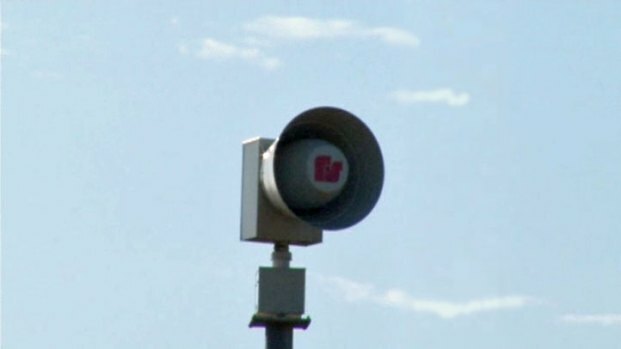 To be sure it is ready for spring storm season, the city will be testing the new siren system, completed last year at a cost of several million dollars. The old system, installed in the 1950s and '60s had just 94 sirens according to Josh Roberts with Dallas Emergency Management, the new system includes 153 sirens. "There were gaps in coverage. They weren't as loud, and they were mechanical, they were aging. And so any time you get old mechanics, things tend to fail," said Roberts. "So that's why the city felt the need to get the new system." Dallas is getting ready for spring storms season by testing their new outdoor emergency siren system. Many of the new modern white sirens, are near the old yellow horn shaped sirens which have been left standing to save the cost of removing them. Some of the old sirens still work, but the new ones are far superior. "They’re more efficient to activate, so easier to activate, more coverage and they’re a bit louder," Roberts said. The city is alerting residents that part of the maintenance contract for the new system includes testing the sirens to be sure they are working properly. "Off and on for the next couple of months as our contractors visit, they’ll be ramping them up and down as part of the preventive maintenance work," said Roberts. The maintenance tests will be only brief bursts of sound. The routine Wednesday tests may last several minutes, as would an actually emergency alert at other times. In the event of an actual emergency the brief tests will be suspended and replaced with full-length emergency alarms.